Know the email address of a missing Senator? Click here to contact them! Returning registered members - Did you forget your password? Click on "Forgot password" in the Member Functions box on the left side of this screen, enter your email address and you'll receive your password by email. You've reached the James Madison High School Class of 1961 social networking site. We're building this site just for the First in Four. Our class claims this unique identity because we were there the first day Madison welcomed students in September 1957 through to our graduation day in June 1961! ...We have a reunion here everyday! This site is absolutely free to the members of the Class of 1961. Your information from this site, including your email address, is not made available to anyone. Our class owns the domain and creates the content. We don't carry any advertising; there are no fees. Of course we welcome your support and participation. The Class of 1961's Library is now open. 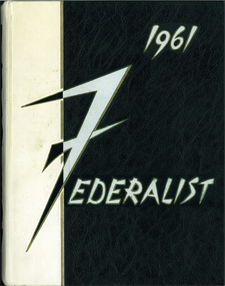 You can check out some of the key documents from our years at Madison including the 1961 Commencement Program, 1961 Federalist yearbook and Reunion Directories from 1971, 1981 and 1986. 1 issue of THE REBEL and 21 issues of The Constitution are available. If you find us more documents we will put then on the bookshelf. Here are the numbers: Our list of Senators from the Class of 1961 included 685. This list was developed from the Federalist Yearbook to which some names were added over the years to include others who journeyed with us through James Madison High School, but may have moved or left before graduation. We know of 150 deceased members listed on our In Memory page. Of the remaining 511, we are missing contact information for 50. Can you help us locate old friends from back in the day? Do you know if any of these are deceased? Click on Missing Senators to review our "Missing Persons" list and either let us know how to contact them or, if you have an email address for someone, you can simply enter that email address into the Missing Senators box near the bottom of this page. The links inside the weather box will open in a new window/tab. Royal Rosarian Prime Minister Stephen E. Smith was the first principal of Madison High School in 1957 and started the tradition of planting a rose bush in honor of the school’s Rose Festival Princess, Stephanie Priddy was the first in a list that now covers 54 years. On April 27, 2007 the Royal Rosarians participated in the 50th annual rose planting ceremony at Madison. Mouse over the cube to control/slow rotation. Click on an image to freeze and view it.